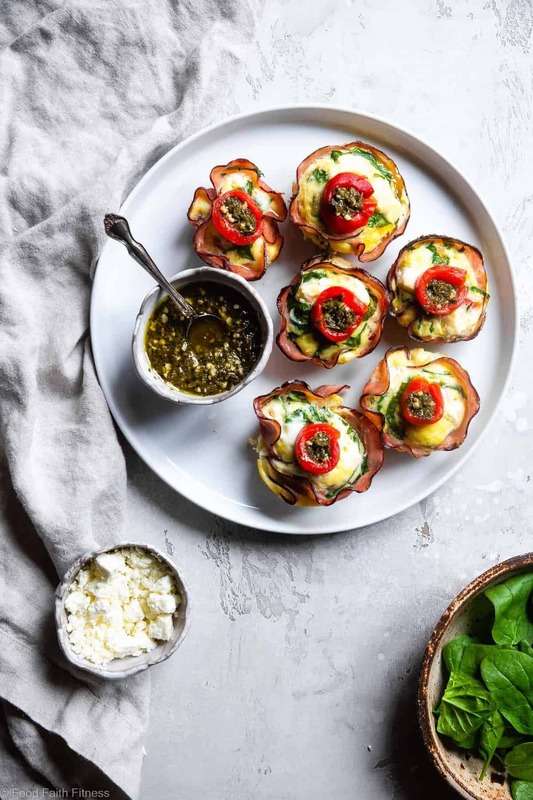 These EASY Keto Low Carb Egg Muffins With Ham have a little Mediterranean flair and are packed with protein! A portable, healthy and gluten free breakfast or snack! Today I bring to you a new kind of meal: the brappetizer. It’s a little bit of breakfast and a little bit of appetizer all in.one.dish. 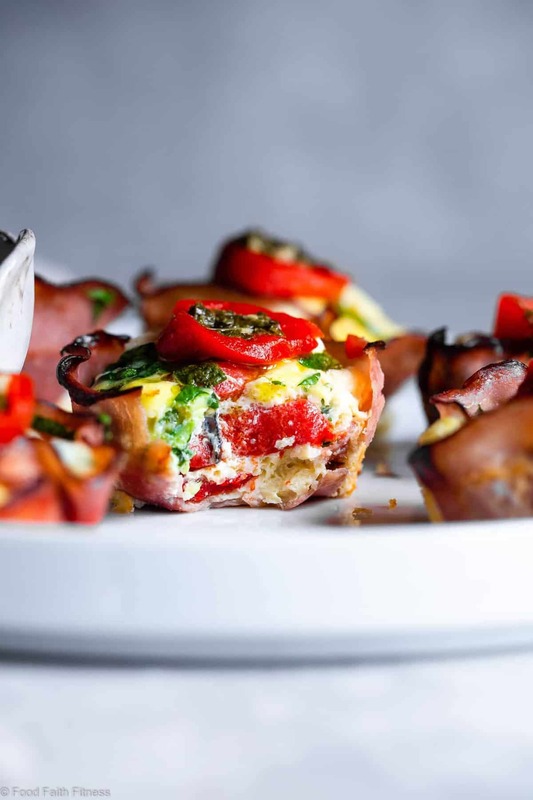 Eat these keto egg muffins for breakfast before you make yourself presentable to the world OR at a fancy party in fancy clothes with your pinky up. It is your choice. All options will be equally delicious. The greatest part of these keto egg cups is that they look like you slaved in the kitchen whipping up the fanciest of food that only the queen (or king) of Fancy Pants Land would eat. You spent a grand total of 5 minutes in there, and half the time you weren’t even paying attention because “Greys Anatomy” was on TV. I could just be speaking for myself though. 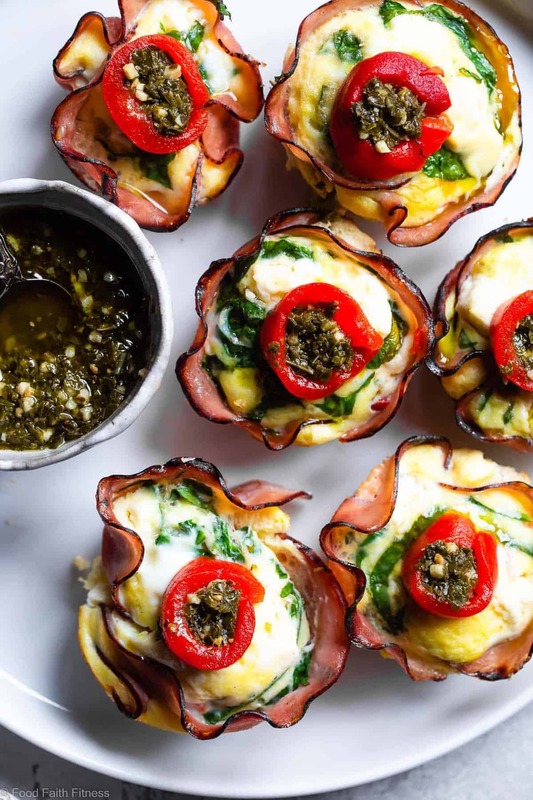 Really though, these little Mediterranean-inspired healthy breakfast egg muffins with ham could not be any easier. Just shove a muffin tin full of some deli ham and then throw a little feta and spinach in there. Top if off with some eggs and throw that bad boy in the oven. When they come out, make them extra prettiful with some pesto, roasted red peppers and basil…BAM! Apparently 2018 has turned me into Emeril Lagasse. I hope the hubs doesn’t mind the change. The hubster and I ate these spinach breakfast egg muffins as part of our Thanksgiving appetizers and we both totally fell in love with them. This is a very good thing because the batches following the original breakfast egg muffins just did not work out. It’s actually a sore spot and I don’t want to talk about it, which means that I will tell you about it anyways. 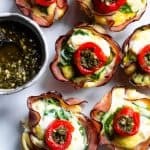 The first time I tried these these keto low carb egg muffins with ham were BEAUTIFUL, 10 times more so than these pictures guys. But, we ate them all. So, I had to make them again because I can’t post pictures of empty plates and tell you to use your imaginations. The next few batches were ugly. So, so ugly. Some exploded, some sunk, and some looked like egg hockey pucks. But, EVENTUALLY, I got it RIGHT and learned how to NAIL healthy egg muffin cups. Line each cavity of a muffin pan with a slice of ham, trying to not leave any space between the ham. Pour the eggs on top until all the filling is covered. Do not beat the eggs too much! This is the key to ensure they don’t fall! You want to cook the egg muffins until they are puffy and the top feels set, which is about 15-17 minutes in a 400 degree oven! Needless to say, we have mountains of ham and egg cups exploding out of our fridge. This is why it is a very good thing that we devoured these because we will have to continue to do so for the rest of our LIVES. Between the pile of keto low carb egg muffins with ham, the rest of the leftover appetizers and Mr.FFF’s leftover hard apple cider, it looks like the inside of our refrigerator is about to throw its own shin dig. Brappetizer, that’s what’s for breakfast. Or dinner. The world is your oyster. 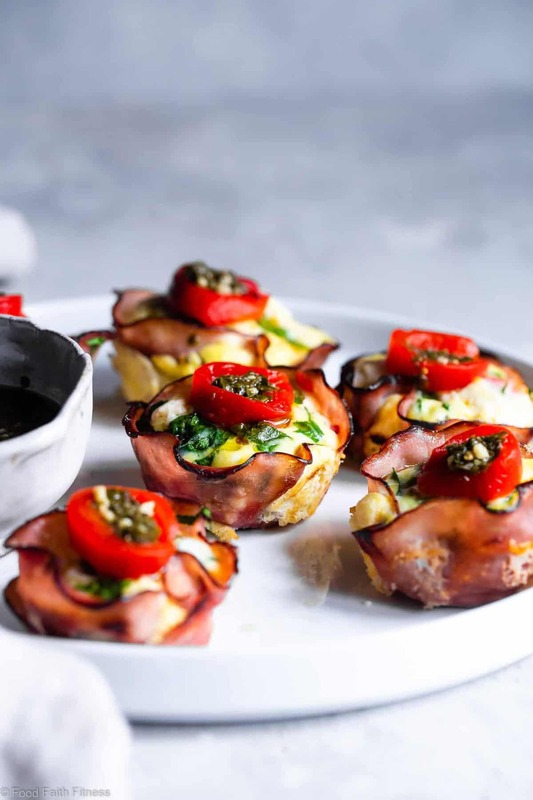 These EASY Keto Low Carb Egg Muffins with ham have Mediterranean flair and are packed with protein! A portable, healthy and gluten free breakfast or snack! Preheat your oven to 400 degrees. GENEROUSLY spray a muffin tin with cooking spray. 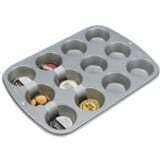 Line each muffin tin with 1.5 pieces of ham, making sure you don't leave holes for the egg mixture to explode out of. Place a little bit of roasted red pepper in the bottom of each muffin tin. Place 1 Tbsp of minced spinach on top of each red pepper. Top the pepper and spinach off with a heaping 1/2 Tbsp of crumbled feta cheese. In a medium bowl, whisk together the eggs salt and pepper. Divide the egg mixture evenly among the 6 muffin tins. Bake for 15-17 minutes until the eggs are puffy and feel set. Remove each cup from the muffin tin and garnish with 1/4 tsp pesto sauce, additional roasted red pepper slices and fresh basil. These are also great cold if you want to eat them for breakfast or a quick snack. It’s a bit more than bite sized! Even my teenage friends take 3 or more bites. I usually need at least 6 bites to finish one of these and the last bite is always the biggest. I have friends who can’t enjoy pesto, so I’ve made some of them without it. Enjoyed them both ways, but prefer the added flavor from the pesto. Have you tried dandelion pesto yet? Healthy or not, I think these look delicious! I wish I had a fridge full of them too! Love this “Brappetizer”!!! it could be for lunch, breakfast or dinner or even an appetizer! BRILLIANT! These are so pretty!! =) I am hooked on your recipes now!! These look amazing!! I love that they are low carb too!! 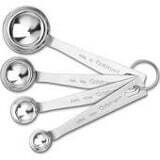 They would be perfect with a side of fresh fruit!! YUM! Thanks for sharing and I hope that you have a lovely Friday! A breakfast and app all in one? I’m sold. And I cannot get enough Mediterranian food … I’m a sucker for all things pesto, feta, and spinach! Have a wonderful weekend! These little cups are so pretty and I love there’s a large amount of options to decorate and garnish with! I love how these look!! I’m always looking for a breakfast that my husband could grab and eat going out the door. I could easily pack these up in to-go containers that he could take. Last time I made him homemade Egg McMuffins! Thanks for the recipe! They were absolutely delish and super easy to make. These are adorable! And so perfect for brunch parties. To be honest, I have not tried freezing. However, my guts says that you can and it wouldn’t affect the taste. The texture may be slightly off, due to the egg whites, but I don’t think it would turn them in-edible! These look great. I will have to give them a try to mix up breakfast a little instead of the same ol’ same ol’. Thank you! Oh, I hope you love them! They are a nice change from oatmeal! These look so pretty, but I am not a big fan of egg whites. Could I substitute more whole egg for less whites? and if so how much? Honestly, I really can’t tell you as the recipe was not developed that way – I’m sorry. I know you CAN do it, and the general rule of thumb is use one egg for every 2 whites, so maybe try that?